The T 34/76 Soviet medium tank, was doing quite well against the German tanks. It had totally surprised the German Panzer crews in 1941. They were finding it difficult to penetrate front sloping armour of this new tank. The Soviet 76 mm gun could penetrate the armour and knock out any of the German fighting vehicles used during operation Barbarossa. 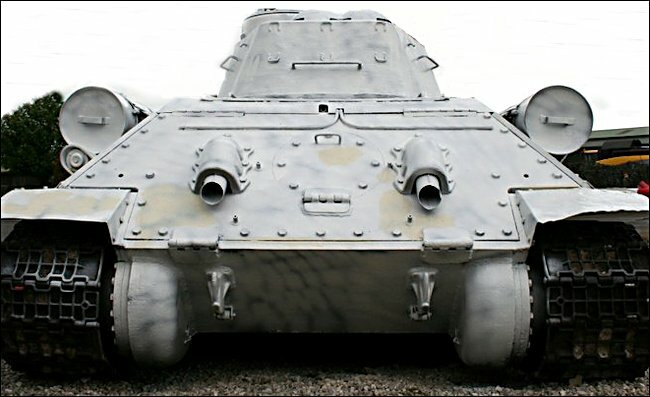 To counter this Russian menace the German panzers had their armour upgraded. Larger higher velocity guns were fitted to tank turrets and as a stopgap measure anti-tank guns were fitted to obsolete tank chassis, whilst better tanks were being developed. With the arrival on the Eastern front of the first generation of German heavily armoured anti-tank assault guns like the Stug III, Jagdpanzer IV, Jagdpanther, Hetzer and Tiger tank, the Russians realise the T 34/76 tank needing an upgrade. The 76mm gun was starting to show its age. By August of 1943 the Russians started investigating if it was possible to put and 85mm anti-tank gun onto the chassis of the T 34 tank. The answer was yes you could but the turret ring had to be increased in size to take a larger turret. An additional advantage came with this increase in size. It could now fit a three man crew into the wider turret. This helped deal with a significant problem of the older T 34 tank. The two-man crew that worked inside the T 34/76 tank's turret found that they were, cramped and overworked. As a fighting unit this led to inefficient work practices which sometimes resulted in fatal errors. 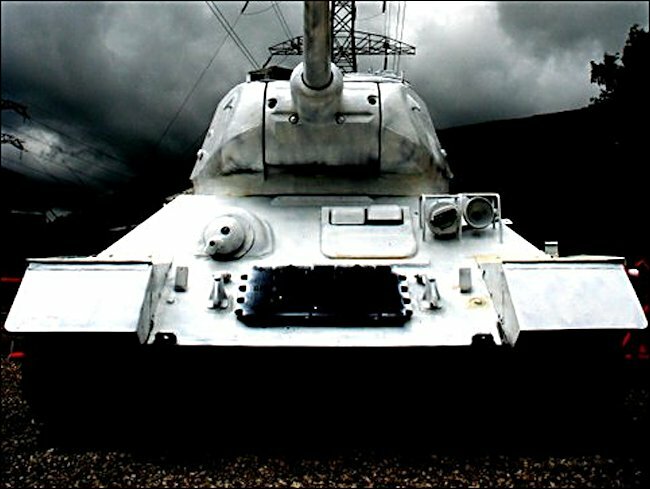 The new T 34/85 tank still had 40mm of welded front armour sloped at 60°. If you look at the front armour plate the bottom right and left you will see an armoured bolt. These were used to control the tension of the track. Because the T-34/85 had slack unsupported track that did not mean you did not have to tension it. If you do not keep unsupported track at the correct tension levels, it will just walk off on its own. Painted white primer during a restoration. 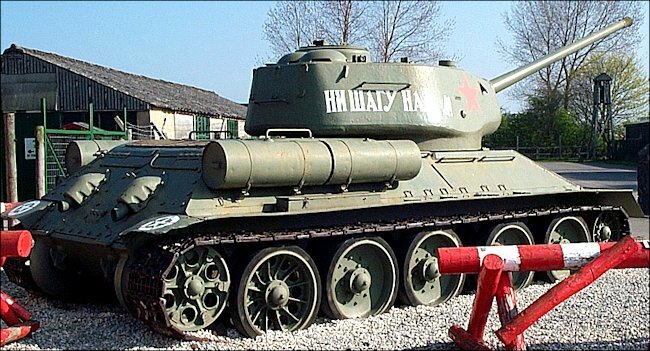 This is the T34/85 Russian Soviet WW2 Medium Tank on display as a gate guard at the Eden Camp, North Yorkshire. 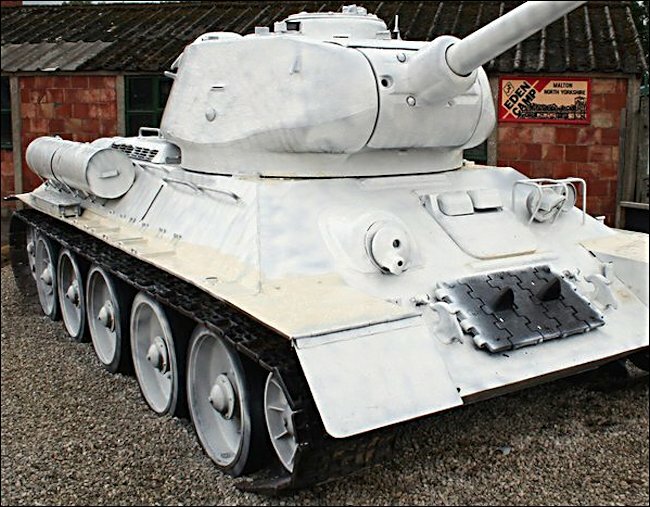 It gives a good idea what the T34/85 would look like in winter camouflage. To make an adjustment the crew had to first release the lock that was on the inside of the tank. You then used a special tool to crank something called a 'worm drive'which would move the idler wheel forwards or backwards. When the correct tension has been applied to the track idler wheel was knocked back into position inside the tank. To tow hooks were added to the front armour below the drivers hatch. Quite often spare track was attached to the front armour for additional protection from incoming shells. On the right-hand side there was a forward facing machine gun the ball mount. On the left side is normally fitted a horn and headlight the road driving. Chassis numbers will often put on the front armour. The first number was the year code. If it was a three then the chassis was built in 1943. If it was a five in the chassis was built in 1945. The next number or numbers would be the month. The last few numbers would be the production number. So a serial number of 411120 would mean that tank was the 120th produced in November 1944. The classical features of Soviet armoured vehicles was the fitting of external fuel tanks at the rear of the vehicle. On the T34/85 the standard size was 90 Liters. They were fitted on each side of the vehicle. On later models four extra fuel tanks were fitted to give a greater range. They were not part of fuel system. They were independent fuel containers. The crew had to physically pump the contents into the tank's internal fuel tank when required. Have a look on the body just under the external fuel tanks next the track. You will see a triangular lump of metal welded onto the side. This was the crude engineering mechanism for working track pins that had come loose back into place. There were no bolt pins like you find another tanks. The Russian engineers did not feel that it was worth adding these very refinements. 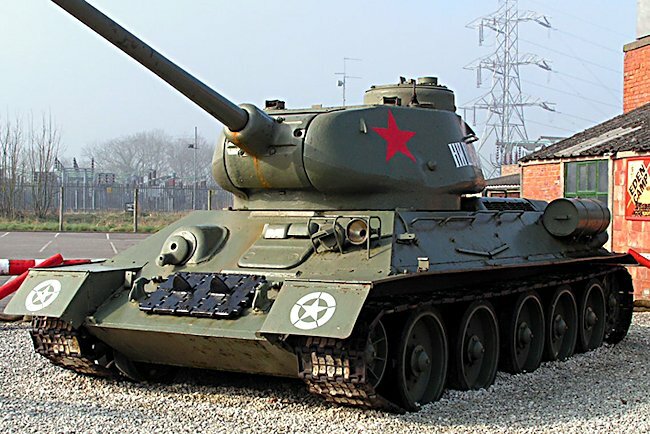 The life expectancy of the T34/85 was only to take part in to 3 battles. One thing you will notice along the side of the tank and on the rear of the turret is a lot of welded handrails. It is just not to help the crew get into the vehicle. It was expected that tank crews would transport infantry soldiers to the battlefront on the back of the vehicle. At the rear of the tank, the armour was 45 mm thick, but again sloped. The round disk in the middle with a handle on it, was a access hatch to some of the engine components. Seven bolts at the underdone first. The entire rear armour plate was hinged and bolted to assist in its complete removal for maintenance. Coming out of the top the rear armour plate in the centre, you will see two small tubes that go left and right. These are for smoke dischargers. In a small cutout at the top of the plate, you can see a red convoy light. Sometimes extra fuel tanks were fitted to the rear of the vehicle. To get access to the engine hatch the turret had to be swung 90°. The T34/85 was powered by V12 diesel engine that produced 500 hp. The only thing the crew could access reasons Hatch was the radiator cooler cap. There were two radiators either side of the engine under the mesh louvres.